In this drama series, two teenagers discover that they were switched at birth and have grown up in very different circumstances. When the two families, one of whom is working class and the other affluent, end up living together, they learn to appreciate both their similarities and differences. The series aired from 2011 to 2017 on the Freeform cable network. In the emotional series finale, Kathryn realizes it’s been five years since the switch was discovered and the two families started living together. As she reminisces, she discovers a long buried family secret that changes everything. Travis and Bay have dinner with his birth mom, but painful memories surface during the reunion. Daphne considers helping Chris cheat on a test. Regina gets an unexpected visit. In an effort to pay their electric bill, Bay and Daphne throw a “lights on” party at their apartment above the Cracked Mug but the night takes a turn for the worse when Toby overhears two students making disability jokes. In the series' 100th episode, a mysterious young woman stirs up memories for Bay and Daphne of their deceased father Angelo. Toby is caught in the middle of his mother’s wishes to baptize his son Carlton and his wife’s feelings about faith. Daphne begins volunteering at a clinic for extra credit and comes face-to-face with her old mentor, Dr. Jackson. While eager to reconcile with him, she grows alarmed when it becomes obvious he’s having trouble properly treating his patients. With tensions boiling over, the Black Student Union stands up to the school administration until their demands are heard. After Daphne and Sharee witness a threat to the Black Student Union, Daphne tries to understand the escalating racial tensions on campus. Returning from London for a visit, Toby and Lily have exciting news to share. Regina must decide whether to reveal her relationship with Luca to the family. After a photo of Daphne and Mingo dressed up as their favorite singers at a college costume party goes viral, the pair find themselves caught up in a controversy that escalates into a discussion of race relations and free speech. Bay seeks a job at the tattoo parlor in town. Kathryn and John court a new shortstop for the UMKC baseball team, while Regina and Luca work on a class project together. Daphne and Bay are captivated by China and decide to stay indefinitely. After 10 months they get an emergency call and drop everything to return home. Upon their return, they both struggle to adjust to life at home. Regina tends to an emergency with Will, so Bay ends up hosting Lily's baby shower. Lily is concerned about what others will think of her choice. Bay tries to decide if she is ready to date Garrett; Daphne and Quinn's conversations are influencing her relationship with Mingo; and John and Kathryn look for new money making ventures. Also, Lily and Toby get ready to be new parents. Mingo puts together a fundraiser with Daphne for a sigh language school in Mexico. Meanwhile: Bay is upset when a student sells crude T-shirts with her artwork on them and Regina has to deal with knowing about Eric's past. Daphne and Mingo are deflated when they learn that their parents don't get along. In addition, Bay's rendezvous with Garrett gets uncomfortable when she bumps into Tank. Bay, Daphne and Travis travel to Mexico to volunteer with Melody during their spring break. Regina leaves the guest house. When Kathryn and John talk about their budget, they decide to endorse products. Daphne wants to be a dorm safety captain so she goes on an emergency service ride-along. Travis travels to L.A. to see Emmett and is disappointed about how his buddy is different. Regina is hesitant to move in with Eric because of Will's mother. Bay signs up for a class at UMKC and receives unwanted attention because of the school's new harassment policy. Daphne's scholarship is in jeopardy. Bay is heartbroken over her breakup with Emmett. John and Kathryn receive some bad financial news. Daphne's friends aren't as impressed with Mingo as she is. Emmett receives an unexpected visit from Bay. Daphne is disappointed with her performance in school. Travis' popularity as an athlete complicates his relationship with Mary Beth. Daphne decides to take Iris's advice and rush a sorority. Bay considers what her next step will be in her art career while Regina extends an invitation to Eric and his son to come stay with her. The forecast of an intense storm forces the family to stay indoors for safety. An investigation ensues after the college administration learns of Bay's personal matter. Bay goes drinking with Tank but has no recollection of the events of the evening. Emmett surprises Bay; Daphne gets a bad grade on her midterm. Bay's criminal record could prevent her from displaying her art. Daphne stands up to the dorm prankster. Daphne's pre-med chemistry class gets off to a rocky start; Kathryn meets with a movie producer; Bay and Emmett are overwhelmed with their long distance relationship. In the fourth season premiere, the family learns that Bay took the blame for Daphne; Daphne starts college. ABC Family is rolling out a new one-hour scripted drama for the summer months. "Switched at Birth" follows the lives of two teenage girls who were given to the wrong parents as babies in the hospital. Growing up, the two girls could not have had different upbringings. One of them, Daphne Vasquez, lost her hearing as a young girl due to meningitis and was raised in a working class home by a single mother. Switched at Birth is currently available to watch and stream on FreeForm. 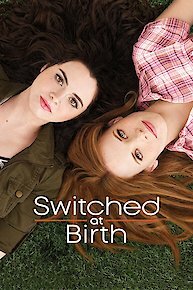 You can also buy, rent Switched at Birth on demand at Netflix, Amazon, Google Play, iTunes online.